Despite strong auction clearance rates in the Sydney and Melbourne property markets, overall dwelling values fell over the last month showing how fragmented our property markets are. The RP Data-Rismark combined capital city index declined by 1.2 per cent over the month of May after falling by 0.5 per cent in April. Despite consecutive monthly falls, values remain higher at just over 1 per cent since the start of 2013. For the month of May, dwelling values declined by -1.2 per cent across the RP Data-Rismark combined capital city index. The May fall was the second consecutive month-on-month decline, with values down -0.5 per cent in April following a 2.8 per cent rise in values over the first quarter of the year. 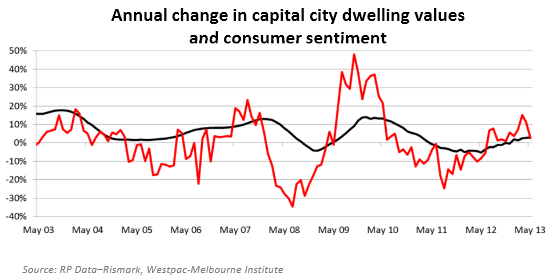 Based on the index results, capital city dwelling values are now 1.1 per cent higher over the first five months of 2013 and 2.9 per cent higher compared to May last year which is also when the housing market broadly reached a recent low point after values corrected by -7.4 per cent from peak to trough. According to RP Data national research director Tim Lawless, the weak May result comes on the back of a substantial fall in consumer confidence over both April and May which can partly be attributed to a growing level of uncertainty about domestic economic conditions and possibly a sour reaction by consumers to the Federal Budget announcements in mid-May. “The RP Data-Rismark daily index tracked higher from late April through to the 10th of May, and then went into a consistent decline over the remainder of the month. How much of this downwards pressure can be attributed to the lower confidence reading is anyone’s guess, but the correlation of housing market conditions with consumer confidence is a strong one. Based on today’s indices results, the fall in dwelling values over the month of May and for the quarter was broad-based with all capital cities apart from Perth and Hobart recording a fall in values over the month, and with half of the capital cities recording a fall in values over the quarter. While most cities experienced softer conditions, Mr Lawless noted that Melbourne stands out as being one of the weakest performers. Mr Lawless noted that the two months of lower dwelling values comes at a time when a number of metrics such as auction clearance rates, vendor discounting, time on market and transaction volumes are performing well. Rismark’s CEO, Ben Skilbeck said..
“There is one of two means by which metrics such as auction clearance rates, transaction volumes and vendor discounting improve; either buyers increase their offer price in order to meet vendor expectations or, alternatively, vendors reduce their expectations in order to meet buyer offers. The first is usually associated with a rising market, while the second relates to a flat or declining market. “Given the weak housing markets of 2011 and 2012 were followed by a very robust 2013 first quarter, we may well be seeing some natural market volatility associated with vendors acquiescing and taking the opportunity to sell. The RP Data-Rismark analysis of rental markets showed weekly rents across the combined capital cities were up 3.1 per cent over the past twelve months. With values shifting slightly higher over the year as well as gross rental yields holding reasonably steady at 4.2 per cent for houses and 5.0 per cent for units. Darwin and Perth are continuing to record the highest rate of rental growth with Darwin rents rising 9.5 per cent and 9.6 per cent for houses and units respectively, and Perth rents up 8.9 per cent and 8.3 per cent over the year.